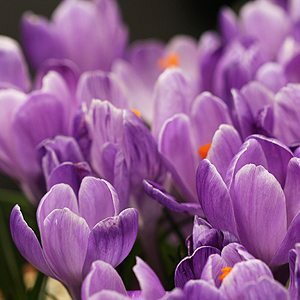 Crocus bulbs with their wonderful flowers are made up varieties that flower in spring, however a few Crocus species will also flower in autumn. A remarkably hardy genus mostly are drought tolerant and require little care once established. With flowers that vary in color varies from pure white through to purples these pretty little plants actually grow from corms rather than bulbs. Crocus can be grown in all but the tropical and dry arid areas, they do grow well in the temperate or Mediterranean type climates. In the garden these bulbs can be planted in the rock garden, in clumps in the border, naturalized into lawns or grown in containers. As the spring flowering species flower early, they are great for planting beneath deciduous trees where they will flower before the tree puts on new foliage. The spring flowering species require a cold winter dormancy, while those that flower in autumn require a warm summer dormancy. Plant around 8 – 10 cm deep with the pointed end facing up. Best planted in groups that will fill a container or in clusters of 8 -12 in the garden. 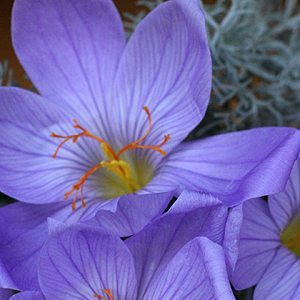 Other than waiting for the foliage to die back before dividing and an annual top dressing of compost with a little blood and bone in winter crocus require little care at all. Container grown crocus will need to repotted every 3 years as they multiply, fill the pot and exhaust the potting mix. For easy flowering crocus for the garden try C. goulmyi, with deep lilac blue large flowers or C. longiflorus with its large scented flowers.